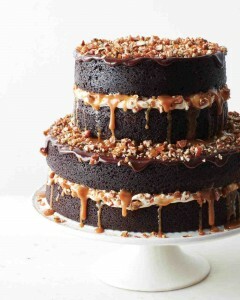 This naked chocolate stout cake would be the ideal cake for the groom. (Of course it would also work as a non-traditional wedding cake, but we really like the idea of a groom’s cake). The cake is a chocolate cake made with stout, and sans icing (perfect for any groom who loves beer). The cake is filled with decadent buttercream icing and then drizzled with caramel sauce AND chocolate ganache. And if that’s not enough, it’s also topped with candied pecans. You’ll find this decadent naked chocolate cake here.